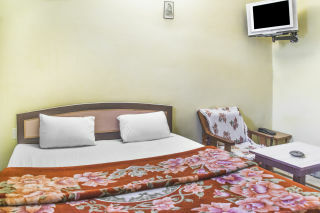 Located 1.9 km from Badal Mahal, this is an offering of a private room in a guest house. 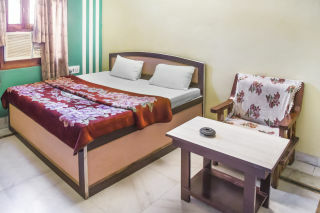 The room on offer can accommodate up to three people and is ideal for travellers with an inclination towards history. A doctor can be arranged in case of a medical emergency. Housekeeping services are offered. Your Space This abode welcomes you with a pale-yellow façade and is fronted by potted plants. 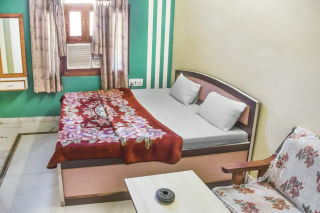 Inside, the room on offer is furnished with a double bed, a coffee seating, a wall-mounted dresser, and a television for entertainment. 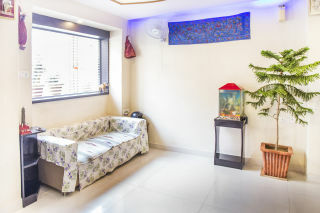 A green accent wall adds colour to the space. 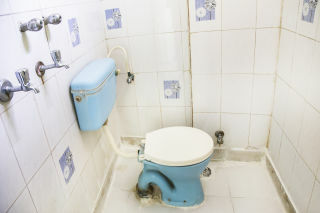 The en suite bathroom is tiled and well appointed with western sanitary ware. Guest Access Feel free to spend leisurely time in the common areas of the property when you are not in your room. Guest Interaction Feel free to reach out to the caretaker present in case you need any assistance. Neighbourhood Overview Jal Mahal is located 2.3 km from the property. These are some of the other attractions nearby that guests can explore: Gaitor Ki Chhatriyan - 2.6 km Kadamb Kund - 3 km Bawadi of Nahargarh - 11.4 km Vidyadhar bagh - 7.7 km Getting Around The property is located 7.7 km from Jaipur Railway Station, 18 km from Jaipur International Airport, and 6.9 km from Sindhi Camp Bus Stand. Additional Information Guests are required to provide valid identification at the time of check-in.